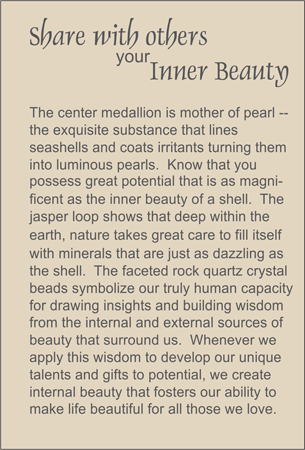 MEDALLION: Mother of pearl medallion from a brown lip shell in triangular shape. ACCENTS: Smoky quartz nuggets and smooth rock quartz crystal ellipses. COMMENTS: This is the only beauty the matters in life and the ones that shines through to everyone. Inner Beauty also comes in miniature size. Scroll down to see.